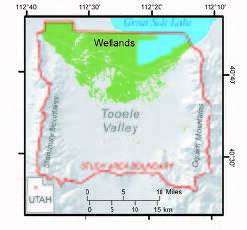 Vegetated (background) and non-vegetated (foreground) mineral flats in Tooele Valley wetlands. The Utah Geological Survey (UGS) and the Utah Division of Water Rights (UDWR) recently began a borehole-geophysical logging program to increase the amount and quality of subsurface data for groundwater aquifers in the state. Previously, well drillers’ reports had commonly been the only available down-hole data for a given region; the borehole-geophysical logging program is providing much-needed subsurface information to state and federal agencies, well owners, and water-well drillers. Borehole-geophysical logs measure the physical properties of subsurface materials penetrated by the well, such as natural gamma radiation, resistance to electric current, and sonic wave travel time. These measurements allow us to interpret the types of subsurface sediments and rocks present at the well site. Borehole-geophysical logs can be used for identifying (1) low-permeability layers, such as clay or shale, (2) waterbearing intervals, and (3) water-quality changes. These data can be used to correlate well-to-well information in cross sections, aid in construction of ground-water models, and help guide well drillers in completing wells. The UGS purchased a borehole-geophysical logging system that includes a caliper tool, a sonic tool, and a multiparameter tool. The system also includes a draw-works to lower and raise the tools in a well (maximum depth of approximately 980 feet) and a data logger to record the measurements. The entire system fits into a trailer that can be easily hauled to a well site. The caliper tool measures the diameter of the well, which can be used to determine borehole conditions, identify fracture zones, and locate washouts (where the borehole has eroded away to a larger diameter). Knowing the borehole diameter allows us to assess the stability of the borehole walls. Since some logging tools are affected by the diameter of the well (e.g., the natural gamma log), the caliper log permits us to account for variations in borehole diameter when interpreting those logs. The sonic tool measures the time it takes a sound wave to travel one foot through the material surrounding the well. The travel time is dependent on the density of the material and can be used to estimate porosity. Porosity data are useful for identifying waterbearing layers and fracture zones. The multi-parameter tool collects natural gamma, temperature, and electric logs (E-logs). The natural gamma log records the amount of naturally occurring gamma radiation inside the well. Since clay minerals generally contain relatively high concentrations of radioactive elements (typically potassium, uranium, and thorium), the natural gamma log can be used to identify low-permeability clay and shale beds. The temperature log records the temperature of the fluid inside the well; temperature gradients help geologists identify layers where water is flowing into or out of the well, trace movement of injected water or waste, and define the geothermal gradient. The electric logs measure the resistance to electrical current (called resistivity). Unaltered rocks and sandy sediments are generally poor conductors of electricity, so most of the current will flow through water in the pore spaces. The response will depend on the amount of water present (which is related to the porosity) and the quality of the water (more dissolved solids in the water results in lower resistivity). Therefore, Elogs can be used to determine lithology, identify fracture zones, and estimate water quality. By using several different electrode spacings, the depth to which the current penetrates the surrounding material can be varied, reducing the effects of the borehole on the log. The UGS and UDWR will select wells for borehole-geophysical logging based on the potential for a particular well log to add to our understanding of ground-water aquifers in Utah. We will focus mainly on single-family domestic wells, which generally are not logged, rather than publicsupply wells, which commonly are logged using geophysical tools operated by private contractors. Once completed, the logs will be available to the public through the UDWR Web site. Through this initiative, we will gain a more thorough understanding of the complexities of Utah’s hydrologic systems. For the initiative to be successful, the UGS and UDWR rely on the drilling community to be partners in the program. Borehole-geophysical logging provides valuable information on aquifer properties that would otherwise remain unknown; this will be of great value to the drillers as well as scientists and water-resource managers.